Legumes can be eaten in their immature state right from the pod (the form eaten by animals), or in their mature (dried) state. Note that immature legumes (includes fresh peas, green beans) have low levels of phytate and a sub-class of lectins, called agglutins. With the aid of soil bacteria rhizobia or frankia, legumes capture atmospheric nitrogen that has entered soil to produce nitrogen in a process called nitrogen fixation (Bacteria form nodule growths on roots, which change nitrogen into ammonia, a form the plant can use); if not present in soil, these bacteria can be "painted" on the seeds before planting. 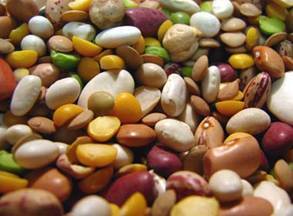 Nitrogen is required in a protein molecule and indeed most legumes have a reasonably good level of protein. Wise farmers plant legume crops alongside other crops or between harvests to replace nitrogen in the soil used by other crops. Soak before boiling or sprouting to remove antinutrients such as phytic acid and lectins. Unlike ruminant animals, humans do not produce the phytase enzyme to break down phytic acid. Note that canned beans are not typically presoaked before cooking and so contain phytate.